Lock in a great price for Arfa Park-Hotel – rated 8.7 by recent guests! 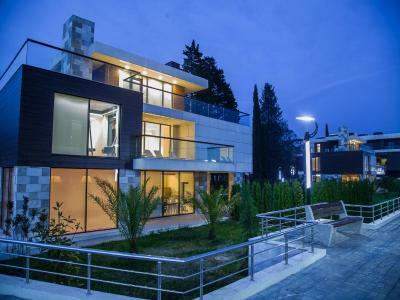 the best resort in Sochi, private villas, safe area, really good and substantial breakfast, patio with the sea view for sunbathing and evening chats. The hotel is just next to the embankment, great location! * The undeniably attractive layout of the hotel that consists of three rows of freestanding villas, several rooms large each. 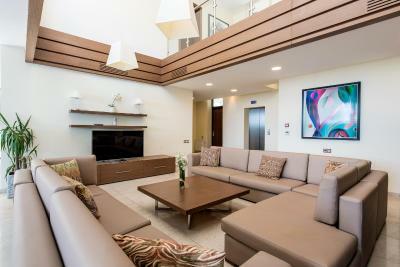 Villas also feature shared spaces, such as spacious living rooms, kitchens, in case you need it, sitting area outside and a (non-heated) swimming pool. * The room was fine - large bed, clean bed linen, enough space, big window overlooking the garden, bathrobes, slippers, the usual. * Seaside nearby - you can take nice long walks. Great location, lots of cool entertainment around, close to the beach, best view, helpful staff, good breakfast. Perfect location. New clean rooms. Great nature. Amazing breakfast. The hotel is composed of differents houses.In one house there is one kitchen and a big dining room for about 5 rooms and a swimming pool outside. The green place and view on the see were super. In our case it was very calm and quiet, but we had to change the room. The see is just in front of the hotel and it's very confortable. The breakfast was tasty but the coffee was really not good. The hotel have also a good restaurant cheaper than the others in the town. It's possible to rent a bicycle for 100r/hour. Good bed, bathroom and massages. 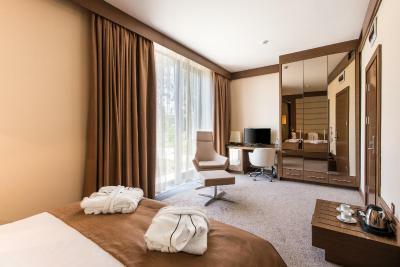 Arfa Park-Hotel This rating is a reflection of how the property compares to the industry standard when it comes to price, facilities and services available. It's based on a self-evaluation by the property. Use this rating to help choose your stay! 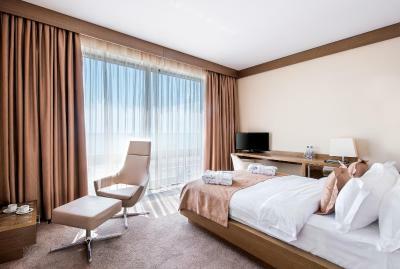 One of our top picks in Adler.Featuring free WiFi throughout the property, Arfa Park-Hotel offers accommodations in Adler on the Black Sea cost near Formula-1 race track and Olympic Park. Free private parking is available on site. Each villa at this resort is air conditioned and is equipped with a flat-screen TV, as well as tea making facilities. 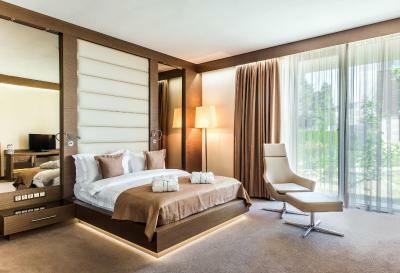 Some rooms include a coffee machine and a seating area to relax in after a busy day. There is a 24-hour front desk at the property. 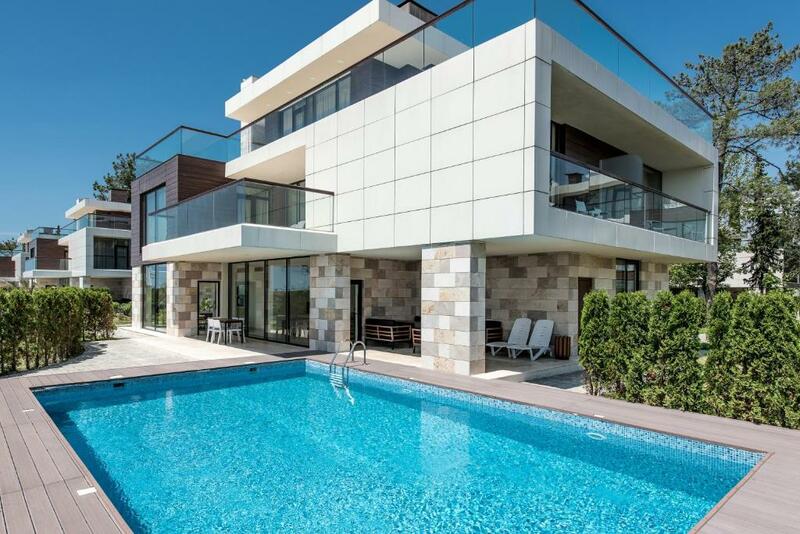 Property features two swimming pools with games zone, Turkish and Finnish sauna and a gym. Bike hire is available at this resort and the area is popular for cycling. 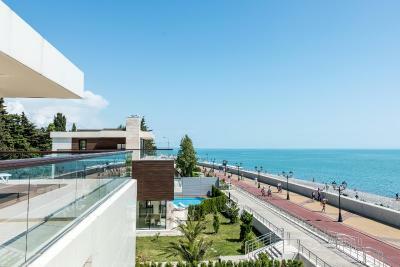 Sochi is 19 mi from Arfa Park-Hotel, while Krasnaya Polyana is 23 mi away. Adler-Sochi International Airport is 6.2 mi from the property. This is our guests' favorite part of Adler, according to independent reviews. This property also has one of the top-rated locations in Adler! Guests are happier about it compared to other properties in the area. 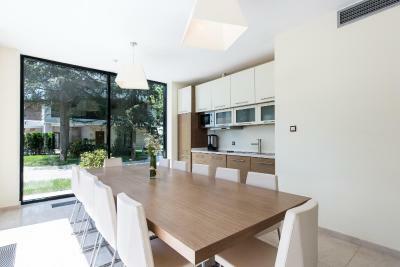 뀐 Located in the top-rated area in Adler, this property has an excellent location score of 9.5! 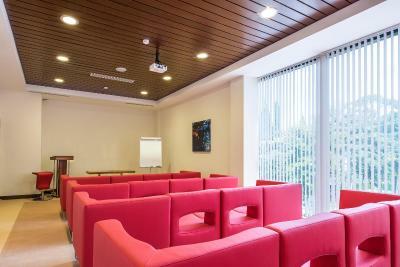 When would you like to stay at Arfa Park-Hotel? 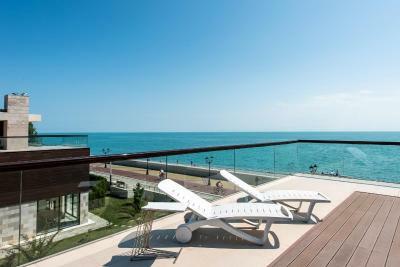 This villa features a private pool and garden on the Black Sea shore. There is a private parking, kitchen and living room with a fireplace. Guests have an access to a private sun terrace with a sea view. This double room has a flat-screen TV, electric kettle and safety deposit box. A private bathroom comes with a shower and free toiletries. 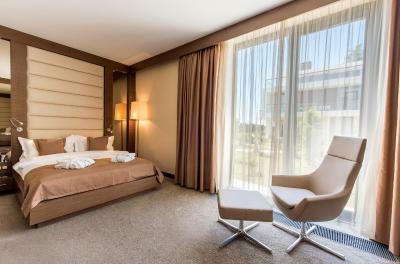 This double room features air conditioning, electric kettle and safety deposit box. A private bathroom comes with free toiletries. The room features a private terrace with a sea or mountain view. This quadruple room features two rooms, electric kettle and safety deposit box. There is also a private terrace. 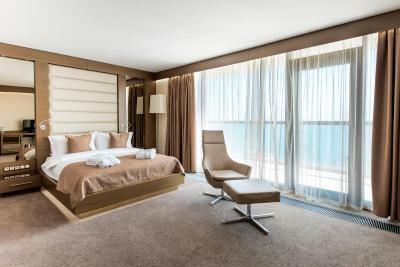 This suite has a terrace with a sea views, seating area and satellite TV. There is a dressing room and private bathroom. House Rules Arfa Park-Hotel takes special requests – add in the next step! All children under 12 years are charged RUB 800 per night for extra beds. Arfa Park-Hotel accepts these cards and reserves the right to temporarily hold an amount prior to arrival. Please inform Arfa Park-Hotel of your expected arrival time in advance. You can use the Special Requests box when booking, or contact the property directly using the contact details in your confirmation. * A bunch of teabags and McDonalds' sugar packs thrown loosely on the baggage shelf (the one you are supposed to put your suitcase onto). * The bathroom would have been nice if it was not for mildew in the shower cabinet and occasional hairs left over from previous occupants on the floor * Had to specifically call the reception to get our room cleaned at 6pm, having returned from a day of absence, since no one bothered to do it, despite the sign on the door clearly requesting for it * Signs of wear and tear in the room, lack of main lights switch by the bedside and some other small details kept us from being impressed. * Problem with the mosquitos - went to the reception to ask for some sort of anti-mosquito device, of which they did not have any, but had promised to look into it. 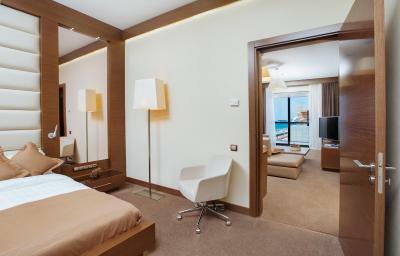 Time passed, nothing happened, on successive inquiry we got the "we do not equip our rooms with anything like that". So, instead of sleeping with open windows and enjoying the fresh sea air, we had to sleep with the closed window and noisy aircon. * Breakfasts were good, but not great, missing variety on meat and cheese plates, the choice vegetables and fruit was also lacking. No smoked salmon, which is a must-have. Pastries - hit and miss. You will get a decent breakfast, but do not expect anything exciting. 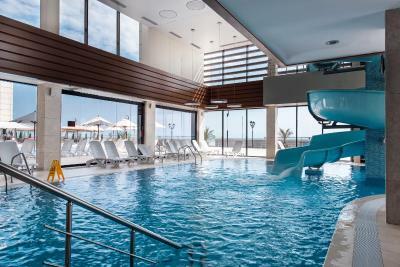 * Spa area functional (swimming pool, Finnish and Hammam saunas), but not very comfortable - too cramped, no atmosphere, slippery floors. Have to pay a deposit for towels. The bar staff offered us a cocktail menu, but they appeared to have no alcoholic beverages at all except for beers. Girls at Restaurant do not speak English , they do not understand what you want. All hotel staff should know English, to be able to communicate with their guests. standard number is not worth the money, in my opinion the price is overestimated by about 2 times - simple decoration inside the room, peeling off wallpapers, feeling of 'life behind the glass' and construction in progress next to the house where we stayed. The restaurant was not working offseason (only breakfasts). They were changing the food provider.